Eggplant is an often overlooked fruit, but its rich, complex flavors are sure to tempt your taste buds. Our classic Moroccan cold spread recipe is redolent with garlic and smoky charred eggplant. 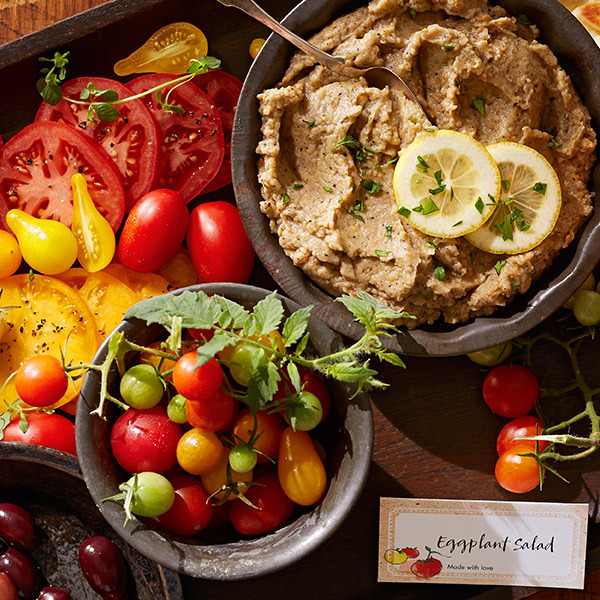 Make this easy Grilled Eggplant Dip a day ahead to meld flavors, and then serve with vegetables or warm naan and pita bread. Build a hot fire in a charcoal grill or heat a gas grill to high. Peel eggplants, and slice into 1 inch slices. Rub with olive oil, kosher salt and black pepper. Grill eggplants, turning until charred and soft, about 10 minutes. Let cool. Place eggplant and remaining ingredients in food processor and puree until smooth. Transfer spread to center of a large serving platter. Surround with heirloom tomatoes, cucumbers and olives. Garnish with a drizzle of olive oil and parsley sprigs. Serve with warm naan or pita.